Our Project DC2 Integra had developed a clunking noise whenever the clutch was let out or if the throttle was modulated. This was really annoying, especially at low speed. We traced some of this noise to our old and worn out OEM motor mounts. The stock motor mounts are soft rubber and have generous cutouts in them to help absorb vibration. These cutouts also allow for a lot of engine movement which is bad because it causes lash in the drivetrain that manifests itself with jerking and even wheel hop. This makes shifting difficult and the lash and hop are hard on the entire drivetrain. 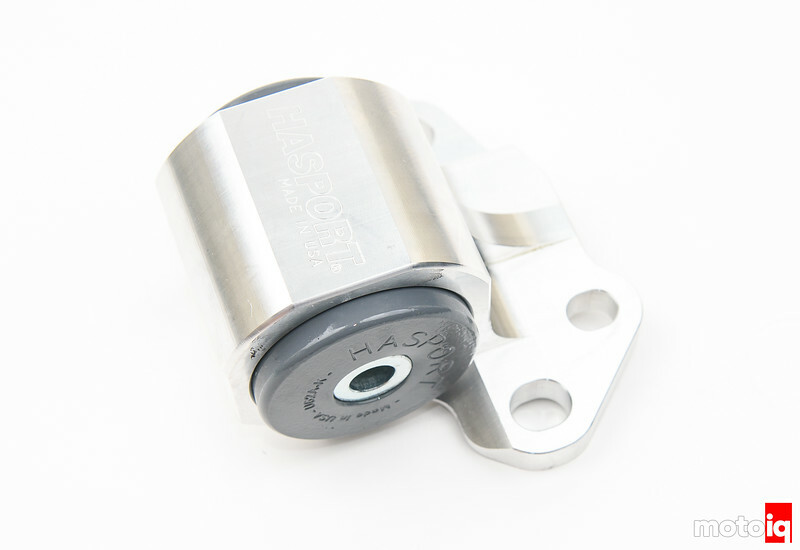 To fix these issues we got a new set of performance motor mounts from our friends at Hasport. Most people know that Hasport is the originator of the Honda motor swap mounts kits and their high-quality CNC machined billet aluminum and polyurethane mounts are still the best in the market. 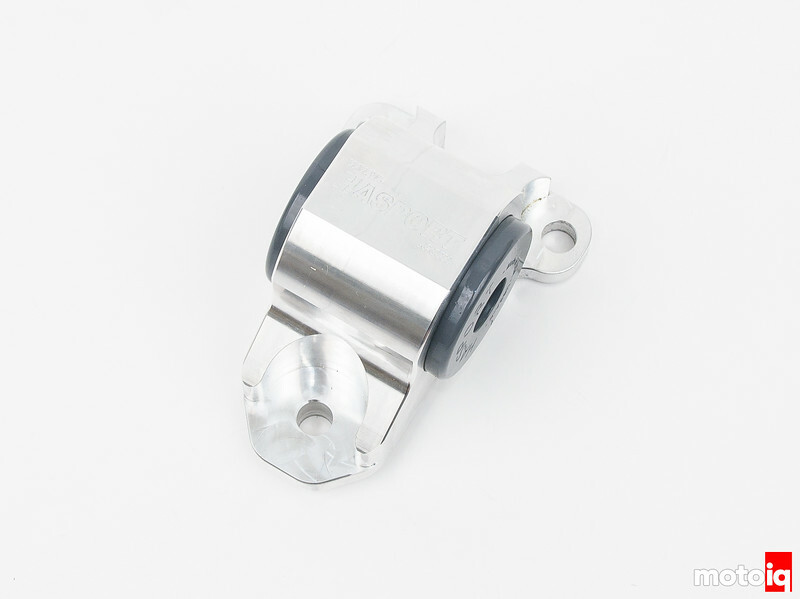 We chose Hasport’s DC2 B-Series mount kit which in this case is a stock replacement kit. For the mount kit, you can choose from 4 different durometers for the polyurethane mount inserts. You have a choice of a soft 62 durometer for street use, a 70 durometer race, an 88 durometer for extreme race, and a rock hard 94 durometer for their most extreme race use. We chose the 62 durometer street mount because even though it’s pretty soft as far as urethane goes, it is still harder than the stock rubber and it is solid with no voids. The 62 durometer offering has been recently introduced to the Hasport line as it sports their new kevlar reinforced urethane. The tough kevlar fibers in the material help drastically increase the plastics tear strength enabling a softer durometer to have just as good or better durability as the harder urethanes. We think that the Kevlar strands also helps the urethane absorb and disperse energy internally as well. In engineering talk, this is a high hysteresis material. This property makes it exceptional at absorbing vibration. We are hoping that the soft urethane with no voids will not increase our cars NVH much while still giving superior movement reducing performance. The Hasport kit consists of three different mounts. This mount is at the front of the engine, attaching to the block in the front by the timing belt going to the frame rail on the driver’s side of the car. This mount attaches to the transmission and links it to the frame rail on the passenger’s side of the car. This mount is underneath the transmission and links it to the cross member. 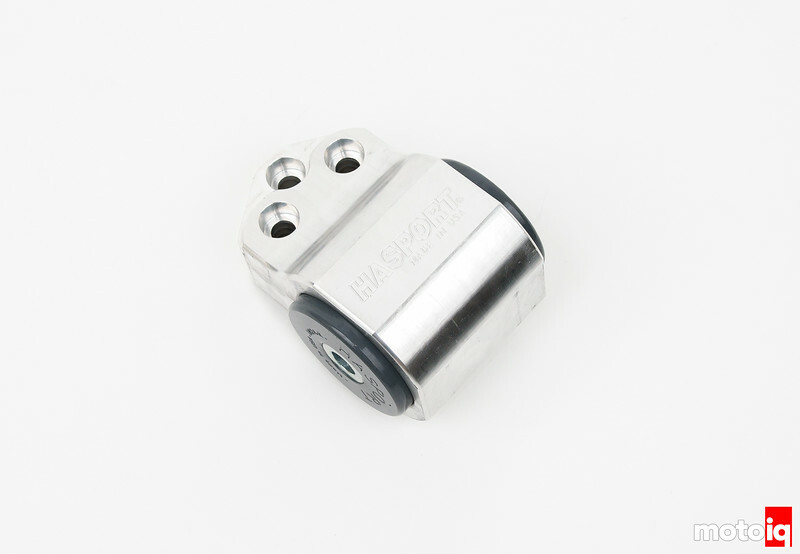 This mount absorbs a lot of the engines torque and limits moment. I had the 70 on my 98 DC2. Can 8points really make that much of a difference in NVH? I really hated the NVH at idle. With my DB8, I am eyeing the Hardrace hardened rubber kits. These seemed to be really close to the clapped out stock parts for vibration and really controlled engine movement. I’ve used hockey pucks to make mounts for the Jetta/Golf Mk3 platform. Works great.